LAW: Corporations Act 2001, Chapter 5; Corporations Regulations 2001. Employees of 19 abandoned companies rescued by ASIC. Companies named. ASIC, Corporate Insolvency, Insolvency Law, Insolvency practices, Insolvency Statistics, Phoenix company activity, Regulation, White collar crime Comments Off on Employees of 19 abandoned companies rescued by ASIC. Companies named. Since mid-2012, when the Australian Securities and Investments Commission (ASIC) was given the power to wind up companies that met certain criteria, ASIC has ordered the winding up of 19 companies. In its media releases ASIC has estimated that those 19 companies have over $1.5 million in unpaid employee entitlements (wages, leave, etc.) owing to 100 workers. As a result of the companies being wound up, those workers will be entitled to claim payment of their entitlements from the Fair Entitlements Guarantee (FEG) scheme administered by the Department of Employment. 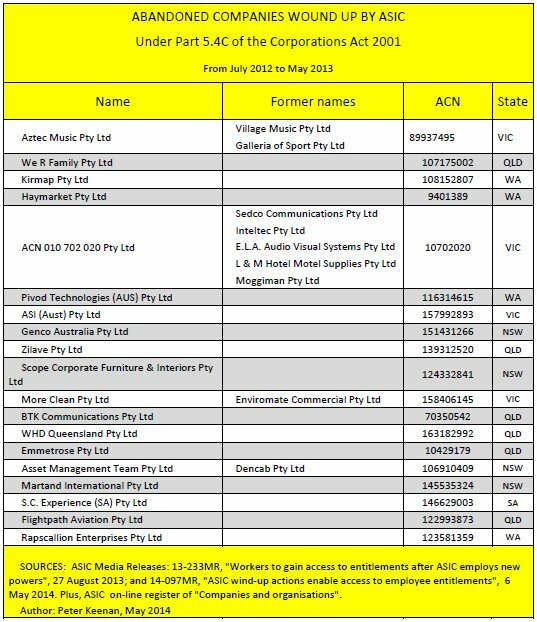 The following chart lists the 19 “abandoned companies” wound up by ASIC. They are called “abandoned” because ASIC believes they are no longer carrying on business and that their directors have effectively walked away from them and their debts. In July 2012 ASIC was given the power to order the winding up of a company in certain circumstances [Part 5.4C of the Corporations Act 2001] [Section 489EA]. In the lead up to this legislation the phrase “abandoned companies” was coined to describe such companies. Shortly after obtaining these powers ASIC decided that its primary consideration when exercising its discretion would be whether ordering the winding up of a company would facilitate employee access to funds from the government’s General Employee Entitlements Scheme (GEERS), since replaced by the Fair Entitlement Guarantee scheme (FEG). [ASIC Consultation Paper 180]. This objective had been the main reason behind introduction of the new law, which was part of the Gillard Government’s Protecting Workers’ Entitlements package of April 2012. A precondition for an employee of a company receiving a payment from GEERS/FEG is that the company be placed into liquidation. How should the public interest test be applied? The Australian Securities and Investments Commission (ASIC) has released a consultation paper outlining how it intends to implement its new power to wind up companies. (d) ASIC has reason to believe that making the order is in the public interest. ASIC may order a winding up if the company’s review fee in respect of a review date has not been paid in full at least 12 months after the due date for payment. (b) ASIC has reason to believe that making the order is in the public interest. (c) neither the company, nor any of its directors, has given ASIC such an objection within the time limit specified in the notice. Comments on Consultation Paper 180 are due by Friday 10 August, 2012. ASIC today released a consultation paper outlining how it intends to implement its new power to wind up abandoned companies under the Corporations Act 2001 (Corporations Act) to facilitate greater access to the General Employee Entitlements Redundancy Scheme (GEERS). ‘When using this power, our first consideration will be if an order to wind up the company would facilitate employee access to GEERS’, Commissioner John Price said. GEERS is a scheme funded by the Australian Government to assist employees of companies that have gone into liquidation and who are owed certain employee entitlements. However, companies are sometimes abandoned by their directors without being put into liquidation. This has previously resulted in employees of the company who are owed employee entitlements being unable to access GEERS. Consistent with the new law, ASIC is proposing to apply a public interest test when deciding whether to wind up a company. This public interest test will consider factors like the cost of winding up, the amount of outstanding employee entitlements and how many employees are affected. ‘ASIC needs to consider the broader public interest when deciding which abandoned companies with outstanding employee entitlements will be wound up’, Mr Price said. ASIC is proposing not to reinstate companies that have already been deregistered in order to wind them up later. Among other reasons, there are already court processes in place to facilitate the reinstatement of a company where that is needed. ASIC intends to commence using this new power to wind up abandoned companies in the final quarter of 2012. Comments on Consultation Paper 180 ASIC’s power to wind up abandoned companies are due by Friday 10 August, 2012. One of the measures of the Australian Government’s Protecting Workers’ Entitlements Package (announced July 2010) is to assist employees of abandoned companies to access the General Employee Entitlements and Redundancy Scheme when they are owed certain employee entitlements. When the employer is a corporation, it must be in liquidation before GEERS can assist an employee. Amendments to the Corporations Act have given ASIC the power to wind up an abandoned company in specific circumstances. ASIC may appoint a registered liquidator over a company when exercising its power to wind up an abandoned company. Although it started out with a dream run, the Bill to allow ASIC to order the winding up of companies has been the subject of considerable debate in the House of Representatives. Joe Hockey (LP) (Opposition); Julie Owens (ALP) (Government); Scott Buchholz (LP); Bernie Ripoll (ALP); Paul Fletcher (LP); Gai Brodtmann (ALP); Deb O’Neill (ALP); Steven Ciobo (LP); Sharon Grierson (ALP); Steve Irons (LP); Kelvin Thompson (ALP); Bruce Billson (LP); Mike Symon (ALP); Bert Van Manen (LP); Tony Zappia (ALP); Stuart Robert (LP); David Bradbury (ALP). None of the debate touches on the technical issues that I pondered in my post entitled Questions concerning new power for winding up by ASIC. New laws have been drafted to give the Australian Securities and Investments Commission (ASIC) power to wind up companies. But what mode of winding up will these liquidations be? Creditors’ voluntary liquidation, or failed members’ voluntary liquidation? And will there be any requirement that directors prepare a statement of assets and liabilities? The focus in this post is on a proposed new section of the Corporations Act 2001, namely section 489EB — “Deemed resolution that company be wound up voluntarily”. In other words, it is deemed to be a creditors’ voluntary liquidation because the deemed resolution to wind up the company is deemed to have not been accompanied by a declaration of solvency under section 494. But then in subsection 489EB(c) reference is made to section 496: a section that only applies where a declaration of solvency has been made under section 494. Section 496 – Duty of liquidator where company turns out to be insolvent – applies in a members’ voluntary liquidation. But how could section 496 have any application? To me the reference to section 496 seems to be in direct conflict with (proposed) subsections 489EB(a) and (b). If section 496 does somehow have some application as (proposed) section 489EB(c) seems to suggest, then it would appear that the winding up by the ASIC is to be a members’ voluntary winding up where a company turns out to be insolvent. If section 496 (for members’ voluntary liquidations) does apply, then section 496(2) – notice to creditors, section 496(4) – liquidator to lay before meeting a statement of assets and liabilities, and section 496(5) – replacement of liquidator, and the other subsections in 496, would be brought into play, wouldn’t they? Is this intentional or are these oversights or unintended consequences? If section 496 is to have some application in a winding up by the ASIC, does that mean that the liquidator may choose a path other than the winding up of the company? I ask this because section 496(1) gives the liquidator the option to apply under section 459P for the company to be wound up in insolvency, or appoint an administrator of the company under section 436B, or convene a meeting of the company’s creditors? Is this intentional or are these oversights or unintended consequences? If the winding up is a creditors’ voluntary winding up, then it appears that — unlike in an ordinary creditor’ voluntary winding up — there will be no requirement of directors to submit a Report as to Affairs (RATA). This is so because the section that does require a RATA from the directors — section 497(5) — seems, along with all other parts of section 497, to have been made inapplicable by the following words of (proposed) subsection 489EB(d), “section 497 is taken to have been complied with in relation to the winding up”. The same would be true of section 497(2)(b)(i), which requires the liquidator to send creditors a summary of affairs (Form 509). It too would be “taken to have been complied with in relation to the winding up”. Which suggests that when a company is wound up by the ASIC there will be no requirement on the part of directors to prepare and submit a statement about the company’s business, property, affairs and financial circumstances. This seems strange given that in the other two types of insolvent winding up – court-ordered winding up and creditors’ voluntary winding up– such a statement is required. Is this an oversight or an unintended consequence? Also, the removal of a duty to do a RATA would be extraordinary when liquidators say – as made clear in my recent IPA sponsored survey of official liquidators – that a RATA from directors is a very valuable tool for the efficient conduct of a winding up. The peculiar phrase “The resolution … does not require a declaration of solvency to have been made under existing section 494” suggest to me a lack of understanding of the law. And the reference to subsection 497(1) is odd given that the proposed law refers to section 497 as a whole, not just subsection 497(1). Has there been a mistake in drafting subsection 489EB(d)? Should it refer more narrowly to subsection 497(1) rather than to the whole section? A Bill just released by the Australian Government’s Treasury department (17/2) contains amendments to the winding up of companies, a new duty for external administrators of companies that are “paid parental leave employers”, changes to requirements regarding the publication of notices, and changes to laws governing deregistration of companies. There is plenty in the Bill that Australian insolvency practitioners will need to be aware of. There are also extensive transitional provisions. To see the Bill and the Explanatory Memorandum click this link to the Australian Government Com Law website.